Description: Yellow crown cap. Red circle around. Red silhouette of a lion in a circle. 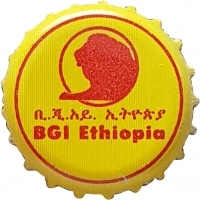 Red Ge?ez characters, and red text: BGI Ethiopia.